xeuca is a TCL-TK based graphical user-interface built on top of CADP and other LOTOS tools. xeuca provides an easy access to the functionalities of these tools, in a way that is often simpler than corresponding command-line invocations. Using xeuca gives a quick overview of the many features provided by these tools. To start the EUCALYPTUS graphical user-interface, type the command xeuca. It is possible to start several xeuca sessions at the same time, even in the same directory, although this is not the usual practice. Unless specified otherwise, only the left button of the mouse is active in the EUCALYPTUS graphical user interface. 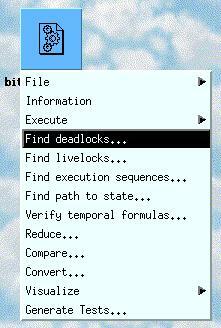 The left sub-window (also called the files window) contains a list of icons corresponding to the files and directories present in the current directory. The icon varies depending upon the type of files (e.g. LOTOS programs, C programs, Labelled Transition Systems, directories, ...) have different icons. Clicking on a directory icon makes the current directory to change and to enter this directory. Following the usual convention, the parent directory is named "..". Clicking on a file icon displays a menu that proposes all operations available for this file. This menu is "contextual" in the sense that the list of operations proposed in the menu depends upon the type of file. Selecting an operation in the menu launches the corresponding EUCALYPTUS tool(s). To click on a file icon, any mouse button can be used and all buttons have the same effect. The right sub-window (also called the text window) displays the output generated by the execution of the various EUCALYPTUS tools. All versions of xeuca higher than 2.0 are distributed within CADP. These new versions are not compatible with the previous versions 0. * and 1. *, which were distributed apart from CADP. To upgrade from these old versions, please follow the instructions given in the $CADP/HISTORY file, under reference number #404; the tst command also provides assistance for the upgrade. To install CADP (and therefore xeuca), please follow the indications given in files $CADP/INSTALLATION_*. xeuca attempts to enforce the conventions regarding the environment variables $CADP_TMP, $CADP_PS_VIEWER, $EDITOR, and $NAVIGATOR defined in the $CADP/INSTALLATION_2 file. See this file for detailed explanation about these variables. It is possible to customize (in a limited way) the xeuca graphical user-interface. The settings specific to each user are stored in a startup file $HOME/.config/cadp/xeucarc. The default version of this file is available in $CADP/src/eucalyptus/xeucarc_standard. The startup file format is undocumented, but easy to understand (and possibly modified manually). Warning: the format of this file may evolve in the future. Version 1.0 of EUCALYPTUS was developed in the Euro-Canadian project EUCALYPTUS using the Xtpanel graphical user-interface generator. Version 2.0 of EUCALYPTUS was first developed by Jean-Michel Frume and Hubert Garavel. It was later improved by Mark Jorgensen and Hubert Garavel (versions 2.1, 2.2 and 2.3). It was ported to Windows by Aldo Mazzilli (version 2.4). Acknowledgements are due to Jean-Charles Henrion (University of Liege), Mihaela Sighireanu (INRIA) and Bruno Vivien (INRIA) for their detailed bug reports and suggestions regarding the early versions 2.0 of the graphical user-interface. Former versions of EUCALYPTUS used to support other tools such as APERO (Université de Liège, Belgium), ELUDO (University of Ottawa, Ontario, Canada), FC2Tools (INRIA, Sophia-Antipolis), TESTGEN (Institut National des Telecommunications, Evry, France), TETRA (University of Montreal, Quebec, Canada), and VISCOPE (IRISA, Rennes, France). These tools had to be removed from EUCALYPTUS either because they are no longer maintained by their respective authors or because they are not available for recent computers architectures/operating systems.